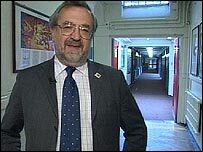 Sir Alan Steer, a serving head teacher who led the government's inquiry into behavioural problems in schools, explains why bullying must be tackled. This year's anti-bullying week - which takes place on 20-24 November - serves as a timely reminder that bullying is one of the most significant challenges schools face. We know that bullying can cause intense damage, both psychological and physical, to children and young people. We also know that it is a complex and deep-rooted issue, for which there are no simple answers. Since September 1999 it has been a requirement for schools in England and Wales to have an anti-bullying policy, which enables them to handle bullying if and when it occurs. These policies are likely to reflect the overall culture and needs of the individual school, with - as Department for Education and Skills guidance recommends - a system of sanctions and rewards, to be applied appropriately according to the severity of the situation. But dealing with specific incidents of bullying is not enough: schools also need strategies for longer term prevention. This means going beyond the immediate situation to look at the behavioural context in which bullying occurs. There is a wealth of evidence to show that when others stand by and do nothing it can encourage bullying behaviour: indeed, one US study, published in 2001, describes the bystander as "the invisible engine in the cycle of bullying". Bystanders may not actively assist bullying, but their failure to intervene can give a message of silent approval, fostering an environment in which bullying can thrive. Of course, intervening is not always easy. While most children and young people recognise bullying and know that it is wrong, there are many different reasons why they may feel unable to act. They may be afraid that they will become the target for bullying themselves; they may feel that it is none of their business; they may simply not know what to do or who to tell. Yet if we are to succeed in preventing bullying, it is vital for schools to promote a culture where it is not tolerated, and where children and young people feel able to speak out when they witness it. In some cases this may mean challenging other prevailing cultures both within the school and in the wider community. One example is children's own dislike of "snitching" or "grassing". This may derive from a sense of loyalty to the peer group, but it may also be prompted by a fear of the consequences of speaking out. Will adults fail to listen or to take the situation seriously? Or will they over-react, and make things worse? There is also the bravado and aggression that many children and young people witness in the world about them, including the media. In an environment where ridiculing contestants in TV competitions, for instance, is a routine occurrence, it is hardly surprising if some young people absorb the message that mocking others is acceptable, even admirable, behaviour. One of the most important elements of culture change is for children and young people to trust that adults will take appropriate action if and when they do report bullying. For adults, this means finding out what has really happened, supporting the person who has been bullied, and identifying a way forward. That is one reason why schools need to ensure that their policies for addressing bullying are clear and that everyone involved - including parents - knows and understands them. And even for the most successful schools, it is crucial to keep reviewing those policies openly, to reflect the lessons learned from bullying incidents as well as acknowledging new trends such as so-called "cyber bullying" which involves bullying via text messages, emails or the internet. It is also crucial to engage the power of the peer group. 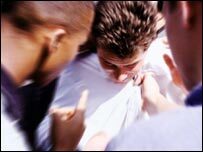 According to the English research for the International Bystander Study which was published in 2005, children and young people recognise that adults strongly disapprove of bullying, but feel more likely to be influenced by their friends, who they believe would support doing nothing rather than intervening. There are indications too that children and young people may take a passive role because they see tackling bullying primarily as the responsibility of teachers and other adults. While schools can reinforce the overall message that bullying is wrong through school-wide sessions such as assemblies, they may also need to look at specific strategies for changing pupils' behaviour. This may involve helping children and young people to develop the skills and confidence to intervene safely when they witness bullying incidents. It may also involve working with peer support groups or school councils, both to promote understanding of bullying and to identify particular problems or flashpoints within the school community. One thing is certain: if schools are to succeed in longer term prevention, they need to build a critical mass of peer support among children and young people, in order to create a climate where refusing to tolerate bullying is the norm.